We are jumping into fall (and football season) with many exciting new initiatives and events! But first, we want to thank everyone for their support this summer. We had many opportunities to show our upbeat spirit, including (Up)Beat Outings and seven third-party events! The New England Revolution hosted 40 JAF guests, patients and their families at a home game this month. Kids had the opportunity to be part of the Rally Tunnel to kick-off the game. It was a perfect evening for a patient outing, and we loved cheering on one of our favorite New England teams. JAF also had the privilege of being honored at various third-party events hosted by gracious supporters throughout the summer. Axeda, a technology company, held its annual customer and IoT industry conference, Connexion, in Boston’s Innovation District. Joe joined the keynote speaker lineup—which included AT&T, GE, Intel, Salesforce and Wipro—and shared the Foundation’s mission with the conference attendees. Axeda graciously donated a portion of the event proceeds to the Foundation: $25,000 to benefit our patients and their families. The Foster Country Club also hosted its 5th Annual Foster Country Club Charitable Golf Classic, and a whopping 100% of the proceeds from thje day benefited the Foundation. This year, they raised more than $40,600, and we couldn’t be more grateful. This fall, more excitement and great opportunities to support our mission are ahead. We cannot wait to see the wonderful things in store for our patients and their families. Thank you to all of our followers for continuing to support us year round. The annual Points For Patients campaign is back again! For our third year, local energy provider National Grid has partnered with the Foundation to help our supporters – and our patient families – win big. We are inviting you, all of our fans, to donate and (Up)Beat cancer with your generosity! For a little something extra, every donor will be automatically entered for a chance to win coveted weekly football related prizes, including home game tickets, signed memorabilia, a clinic with Joe and more! And National Grid has pledged to match every donation, dollar for dollar, up to $25,000 during the 2014 NFL season, doubling your opportunity to pay it forward. For a chance to win, donate by texting the word POINTS to 41444 or visit bit.ly/1ASJMbI. Donate today and score for our patients! To learn more, click here! On National Coffee Day, September 29, JAF announced a sweet new partnership with Honey Dew Donuts! We’re joining forces with New England’s largest locally owned coffee and donut shop chain to raise funds for cancer patients and their families. Now through the end of October, Honey Dew Donuts is selling $1 JAF window decals at all New England store locations, and has also pledged to match and donate all proceeds of the decals, dollar for dollar, to the Foundation! Honey Dew is also featuring JAF branding on their coffee cups and in stores, and has unveiled a special (Up)Beat red and blue-sprinkled, chocolate frosted donut; a portion of the donut proceeds will benefit the Foundation as well. This year, we are proud to join the rest of the country for the annual Be Bold, Be Bald! fundraising event. On October 17, participants across the US will go bald by boldly wearing a bald cap—or even shaving their heads—to honor those who bravely fight cancer and raise money to support cancer causes. Join the movement by donning your cap and raising money to support the Foundation and the patients and families we support. We hope you join us on October 17! Please join us for a night of thankfulness and celebration at this year’s Gratitude Gala presented by East Commerce Solutions, Inc. – same amazing event, new name – to celebrate seven successful years of fundraising, our upbeat spirit and your generosity which enables us to give cancer patients and their families help, hope and a reason to smile every day. Save the date and be there on Monday, November 24 from 6 to 10 p.m. in the Putnam Club at Gillette Stadium. This year’s keynote speaker will be the Honorable Martin J. Walsh, Mayor of Boston and childhood cancer survivor. The celebration, featuring a cocktail reception, elegant three-course dinner and impressive live and silent auctions, is gearing up to be a night to remember. We hope to see you there! For all the details, please click here! Our plans to get #TeamJAF on the streets in 2015 are in full gear! We look forward to the 119th Running of the Boston Marathon, which is scheduled for April 20, 2015. We are also excited to announce that we have been accepted by the New York Road Runners to take part in the New York City Half Marathon, scheduled for March 15, 2015. If you are a qualified, registered or charity runner and wish to run for the Foundation for either event, please send an email to Team JAF@JoeAndruzziFoundation.org and we will send you further details once they become available. Please be sure to indicate which race you are interested in; we hope you’ll hit the streets with us in 2015! Mike Walsh, 48, truly embodies the Foundation’s upbeat attitude. After being diagnosed with colon cancer in 1997 and terminal cancer in his lymph nodes in 2012, Mike has continued to fight a truly inspirational battle. 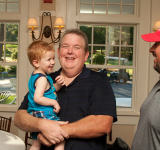 He graciously shared his story with us as the patient speaker at the 6th Annual Joe Andruzzi & Friends Golf Tournament. He is living life to the fullest, and encouraging everyone to stay upbeat. To read more about Mike’s story, click here to go to our blog.